The prime spot would be the actual regatta site, the TradeWinds Resort. and cost level, here are some more ideas. renting a car anyway, as a measure of time it takes about 15 min to drive clear across to downtown St.
Petersburg, where the St. Petersburg Yacht Club is located. some boats at the downtown yacht club. We've just located a five bedroom house (with 8 beds) that is available from April 14 to April 29, 2012. The grand total for the entire stay would be USD $4798 (for 8 competitors, that's $600 US per sailor, although they can take up to 16 people as several of the beds are queen-sized). More info is here: http://www.mountcastleproperties.com/id2.html. There's a kitchen, wi-fi internet, tv, etc. We'll send out more info on accommodations as we find it. Happy holidays! Another really nice property is available. It's about a 30 min walk to the sailing area - with a 27 foot pool! This would be ideal for a couple of families or three couples who are looking to make the Worlds into a holiday as well (or you can make people sleep by/in the pool). It is available from April 16 to 30, and the total cost would be $4250 USD (with a $500 damage deposit refundable after two weeks). That would be about USD $425 per sailor! One more which would be ideal for sailors coming with families or anyone willing to split king sized beds/couches/etc. This one is $1575/ week + 12% FL tax with a $500 security deposit, refunded after departure. The will give a slight discount for a two week booking and can also take a less than two week booking. The ad is here: http://www.vrbo.com/347453. Oh ya, this one is about 2.5-3 m from the sailing site. Info regarding the upcoming 2012 worlds in beautiful and sunny Florida. The event takes place in St. Petersburg, which is facing the Mexican gulf. The event website site is http://www.spyc.org/Contender here you can find notice of race, online entry and all the other usual information you would expect. Don't forget, a late entry fee kicks in on May 20th so why not get on and enter now to make sure you avoid it. I am pleased to announce we have 2 more Sponsors on board for the event. They are Selden Masts(www.seldenmast.co.uk) and Segel Von Broen (www.segelvonbroen.com). More information on these companies has been (or will be shortly) added to the Worlds web site but in the mean time, why not visit these companies own web sites and see what they can offer you. 3rd Prize: A SLAM winter jacket with event logo courtesy of Craftinsure. Tickets are £5 each or £10 for three and the draw will take place at the Worlds prizegiving dinner on Friday 22 July 2011. Don't worry if you can't make the dinner, you can still win a prize. Proceeds from the draw will be ploughed back into the event to make what promises to be a great event even better. Tickets will be on sale at various UK opens, Kiel week and the Weymouth event itself so dig deep, support your class and buy yourself the chance of winning a great prize. I am so happy to bring you the fantastic work of Marco Versari and the Italian Contender Association. Together they have put together a professional DVD training video. Marco worked hard to train and was able to be second at the Contender Worlds in Kingston Canada in 2008. He has trained with Marcus, Andrea, Christoph and is now a professional sailing coach. He brings his skills to the video and helps learn how to sail the Contender, as well as how to rig and tune the Contender. http://www.youtube.com/watch?v=ClhjyzLgdX8 - this is the first one then you will see the rest on the right. It is also available for download from ftp so you can burn your own copy. The dvd cover is also available there for download. Thank you again for the hard work making the video, and I hope you guys enjoy it. A great time was had by all (I think) superb afternoon thermal winds giving exciting racing for all in an interesting atlantic swell/ chop. A big thanks to all the organisers, JFD and FR especially of the Fench Association for putting a lot of time in and making it happen and an enormous thanks to Ron Duffield for coming over and measuring us all. Thanks also to the team at SRR for running the event and of course thanks to all 92 competitors for making it the sailing event it was and of course the people who came 5th and got the special privilege of writing a report too, now there's something to aspire to! Overall results were Andrea Bonezzi 1st, BB Johsen 2nd, Simon Mussell 3rd, Soren Andreasen 4th, Jan Von der Bank 5th. and fiinally see you all in Weymouth next year for more of the same! Having spent a lot of time over the last couple of visits to Highcliffe staring at a glassy flat calm and fiddling with boats bits that should otherwise be well left alone, the Contender fleet were itching to climb into their foul weather winter wear and face a cracking weekends forecast. The weekend of 1st and 2nd May didn’t disappoint. The first race set off in an increasing force 3. A pattern was set for the weekend with Simon Mussell, built for a breeze, followed down the pumping reaches by current champ Graham Scott and with local Gary Langdown in 3rd. This group pulled away from the bunch to finish in that order with Keith Paul, rolling back the years finishing 4th. The wind was up a touch for the 2nd with solid trapesing upwind and down. Again Mussell lead to the finish with Scott sniffing around his stern. Stuart Jones joined the cosy front four levering Langdown to 4th, his cause not helped with mast and sea meeting. The 3rd race saw the wind decreasing a touch and becoming a bit patchy. Martin Jones took advantage of this, arriving at the windward mark with a good lead. The cosy group weren’t about to have someone spoil the fun however and Martin was slowly reeled in. At the finish the front four were slightly shuffled with Langdown taking the gun from Scott with Mussell down to 3rd. Stuart Jones then made up the usual group. The evening was all banter and chilli, stoked up with a few brews and talk about how the forecast was lighter for Sunday. That’ll stop fattys gallop, he’s had a few too. Forecasts are just that however, and it was a shifty force 4, straight off the cliffs as Mussell took the lead that morning. Jones followed at a distance and was pleased to get the lead when Mussell misjudged the layline, having to put in a couple of extra tacks. It stayed this way to the end, with Scott and Langdown a distance off the leading pair. The wind then turbo charged up, catching out a few with their light weather settings. The start of the final race was problematic as the wind shifted wildly before settling. At the second attempt the fleet headed off into a stonking, gusty, sometimes up to 30 kts, patchy force 6. Scott noticed a huge shift out to sea to be over the horizon at the first mark. Mussell lead the rest, with Langdown, despite a dip tacking, in third. Jones completed the cosy group again, but boat handling was the thing and he was gone for good on the reach. Scott cruised round on his own to win in the wild conditions. Mussell held a meeting winning 2nd and Mr 100kg, Nick Noble, broke up the group pushing Langdown into 4th. Simon showed again that blistering boadspeed and better than average handling pays dividends. He thanked ex-contenderer Paul Walker for his improved race officering, a pointed barb at last years Nationals result that has rumbled on at the Highcliffe bar ever since. Does Paul care, I think not……. Last weekend the titles were held at Mornington Yacht Club, 10 Contenders fought it out in light winds under clear skys. Jono was the clear winner with 4 bullets followed by Dan Kohlman in 2nd and David Leask (NSW) took 3rd place while Jon Newman took out 4th place. Special thanks to Wichard who donated Wichard Multitools for trophies and Mornington YC who were able to fit us in at late notice. The race officer did a fantastic job of running the event, and managed to hold 4 races, 1 on Saturday and 3 on the Sunday morning. Matt Kee rocked up with Hosie's old boat. Andrew Butler came over from Geelong sailing Dubbo's old boat and Pat Moore a young fella from Somers SC attended his first states in Chris Chambers old boat. The NSW guys, Brett, David and Peter Murphy made the trip down from NSW although on the water Brett and David were rarely separated by more than a boat length, makes you wonder why they travelled a thousand km to sail against one another? 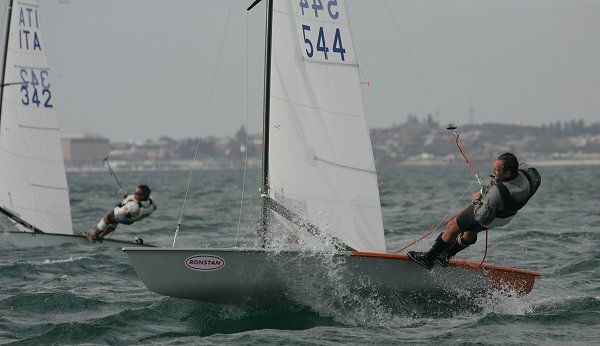 The 2012 Nationals will be held in Victoria, at this stage Mc Crae Yacht Club, Somers Yacht Club and Geelong have been put forward as a possible venues. Notice of Race is given for the Contender 40th Anniversary regatta to be held 19-20 September in Italy. In addition to the information below, you can download a PDF which contains full and further information in English and Italian. We interviewed the women sailors to see what they thought of the Worlds - up from 2 women last year to 9 registered this year. Here are a few links to photographs taken during the Worlds in Denmark. Click photo for link. This photo and more by Stefan Schafft. This photo and more by Ann Seidel. Day 3 (Wednesday) of the Contender Worlds, the final day of seeding to determine who would be in the gold and silver fleets, opened with overcast skies and not much wind (4 – 5 knots). Racing was postponed for an hour, and then race one took place in around 6 knots. Bjarke Johnson and Soren Andreasen scored bullets in their respective fleets. The wind began to build for the second race, and in decent chop and 14 knots, 2008 European champ Giovanni Bonzio scored a bullet. The rumours around Sonderborg Yacht Club were that Day 4 (Thursday)of the Worlds would have a lot of wind, and the rumours turned out to be true. At 9:30am, the anemometer at the club already read 8 metres per second (which is roughly 16 knots). By 10:30, half an hour before racing was to start for the gold fleet, the wind meter was ready about 13 m/s steady with 15 m/s gusts – and a helpful “hold onto your hats” was running underneath the wind readings. Even the Aussies looked a bit hesitant. Several sailors had already departed for the racecourse, which resulted in some impressive capsizes (one contender did a backflip going upwind when the wind caught its bow at the peak of a wave and flipped it backwards), and unfortunately Ann Siedel, one of nine women racing, snapped her carbon mast on the way out. The decision was made to wait until 4pm to determine if any racing would happen for the day. Day 2 (Tuesday) for the Blue Fleet dawned with the wind around 14-18 knots (around west). The wind increased a bit from 3rd to 4th race. Simon (GBR-2420) was first around 1st mark, after him, Matt, Christoph, Jan and Jacob. We were trapezing on the reaches. 2nd upwind, the wind was the same and the direction changed just as much as earlier races. Simon was first and Jacob second around the top mark. Simon was fast on the running and increased the distance to those behind him. On the last upwind Simon stayed in front all the way to the finish line, Christoph 2nd , Matt 3rd , Jörg 4th , Jacob 5th . The 5th race started in a fair 8 knot south easterly. The race committee did a good job keeping the fleet postponed until a steady wind had settled in. The start saw Simon and Matt from GB and Chris Sutherland from AUS commit left and lead at the first mark. Andrea and Soren also had good starts, however the first reach revealed one of Andrea's weaknesses (reaching in light wind). The final lap was really exciting with close racing between the top 5. At the end Soren sailed the best with only 15 seconds seperating 1st and 5th. All in all good fun racing in Blue Fleet. Yellow fleet race 1 was a classic race between Graham Scott from UK and Andrea Bonnezi from Italy. Graham won, 3rd and 4th were Jens and Australian Jono Neate. The other interest in the race was a number of boats missed the course change and the resluts will change this evening as its sorted out. Race 2 was another classic, Jens and Andrea headed left from the start, with Joachim Harprect doing well in the middle, Ben Holden (UK) and Chris Sutherland (AUS) were pushed right and went hard to that side, as the fleet merged Jens, and Andrea were ahead. The reaches changed nothing but the leading 10 were close at the bottom, Chris Peile, Chris Sutherland and Ben Holden headed left, and did well up the work. The run changed nothing but the fleet bunched and 8 boats rounded together. Ben Holden and Chris Peile again headed hard left and Ben won the race, Andrea 2nd and Chris Peile 3rd. The yellow fleet got away first time for race 3 in a building breeze of approx 12-14 knots, shortly after the start a large left shift favoured the boats on the left side of the beat. Bonnezi got it correct and led round the mark from Scott and Holden. These positions remained down the reaches. The race committee changed the position of the windward mark which caused confusion amongst some of the fleet including Holden. At the time of writing there are approx 30 protests from the race committee pending aginst boats that sailed the wrong course. At the top of the beat although going quicker Bonnezi misjudged the layline and allowed Scott to close followed by Neate, Langdorf and an improving Langdown. Scott passed Bonezi on the run and held on to take victory with Bonnezi second followed by Langdorf, Neate and Langdown. German SailorKay Rethmeier writes:At the start I decided to start at the vessel with nobody behind me. I went to the right side. After a tack I was able to observe the drama with the second yellow mark, where „Backe“ (Jan von der Bank) was sailing to. But Sören crossed my way and I was sure to take the orange one. The next downwind course didn’t change a lot except Dirk Müller was taking a bathJ. I guess I was something about 10th. The next upwind course I decided to go to the right side again, nearly alone. By this I got 2-3 boats. The wind was changing a bit between a lot and plenty of wind. With a flat sail and a bit loose in the sheet I was flying the new mark 1. The downwind didn’t change a lot. The last upwind course I took the left side up the half, and right through the middle. I reached the finish from the left side, where Sören won the race and was waiting. Yellow fleet race one was a classic race between Graham Scott from UK and Andrea Bonnezi from Italy. Graham won, 3rd and 4th were Jens and Jono Neate. The other interest in the race was a number of boats missed the course change and the resluts will change this evening as its sorted out. Race 2 was another classic, Jens and Andrea headed left from the start, with Joachim Harprect doing well in the middle, Ben Holden UK and Chris Sutherland AUS were pushed right and went hard to that side, as the fleet merged Jens, and Andrea were ahead. The reaches cchanged nothing but the leading 10 were close at the bottom, Chris Peile, Chris Sutherland and Ben Holden headed left, and did well up the work. The run changed nothing but the fleet bunched and 8 boats rounded together. Ben Holden and Chris Peile again headed hard left and Ben won the race, Andrea 2nd and Chris Peile 3rd. Day 1 of the World Championships finally dawned in Sonderborg, Denmark. The 100+ competitors were divided into Yellow and Blue fleets following qualifying races. The start line for the Blue fleet was slightly biased to starboard, with a clean first start in 10-12knts of breeze. Andrea Bonezzi made the most of the first leg, tacking over to starboard early, using the right hand side of the course and shift to the right and showing strong speed to get him first around the top mark. The group that went middle-left off the start didn't fair as well with the wind shifts, with the best placed of those that went left being Chris Peile in 7th position around the top mark. Thanks to the Italian Sailing Federation (F.I.V), the Italian Contender Association (ICAI) was able to display a fully rigged contender at the 'Big Blu', the latest Nautical Expo held in Rome between the 26th February and 3rd March. The boat was borrowed from Mario Mambro, a contender sailor with 30 years' experience. The boat, a beautiful fibreglass Nordest built in Italy, was rigged with Avantgarde carbon sticks and the new Elvstrøm laminated sail just tuned by the 2008 European Champion Giovanni Bonzio. The 2009 Danish Boat Show was hosted by the town of Fredericia. It was held over two weekends, the last weekend in February and first weekend in March. Despite the gloomy economic climate, the exhibition was very crowded, with many more visitors than anyone had dared hope; more than 37,000 visitors spread over 6 days. The Danish Contender Association was represented at the exhibition in the form of a fully rigged dinghy kindly lent by the Danish President (a 1 year old Schappi boat with wooden deck). Our stand was situated in an extra exhibition tent, where we and other dinghy classes were present, including showcases from the Hobi, Moth and 29er. We were next to the Danish Olympic Gold 49er which also drew an extra crowd. We made sure that they didn’t steal our boat on the final day! Welcome to the Worlds ? 2009! Get set for the 2009 Worlds! Online entry, city info, accomendation info and all the other information that you need is now online. The notice of race still needs a few minor changes, but should be up there shortly. Dates are still July 25 to 31. Accomendation information. There are two options. Option 1 (Andrea style) stay on the grass(tent) or the harbors parking(caravan/ motorhome) , use the harbor's facilities(showers/ toilets), this cost you 20 euro for the week(this cover electricity and cleaning etc). They hosted more than 200 caravans at a youth regatta last year, so there is space enough! Option 2, right behind the harbor there is an real campsite with space for caravans, tents and mobilehomes, they also have small houses/cabins for rent. There is a kids playground and everything else you find in normal campsite, there is a 20% discount on the tent/caravan/ mobilehome space rental fee, remember to mention the contenderworlds during your registration. (I don't believe the 20% applys for the rent of the small houses/cabins but ask) There is much more information off the campsite on www.contenderworlds 2009.dk and also information around youth hostels and hotels. If we get the first 50 entries in within the next 2 weeks then the Danish contender class will sponsor free beer to everybody after the saturday measurements. Light winds today meant only one race was sailed on the Foxtrot course.The fleet eventually got away in light winds with the wind shifting at times up to 90 degrees. A busy start line saw a couple of sailors get OCSs on the score sheet.Christoph Homeier, Christoph Engel, Ethan Bixby and Marco Versari led at the top mark with Marcus Hamilton the defending World Champion back in 9th place with Soren Andreasen from Denmark behind him. On the second windward leg with the wind shifting as much as the first Marcus used his lotto ticket to choose which way to go and came round the top mark in 2nd position which he held onto down the run to the finish with Max Billerbeck in 3rd and Soren in 4th. Oliver Brandt was first over the finish line but was unfortunately one of the boats over at the start along with Soren giving Marcus the win. Christoph Homeier leads the series at the end of day 2 after putting a 4th in today.So it’s all to play for as we wait for day 3 of the 2008 World Championships! Video - shot in beautiful Fort Henry - the gang went in a school bus had a bunch of fun. Today the first day of the 2008 Worlds the fleet was ready after measuring in and sailing the Canadian Nationals for two days in the nice South Westerly’s that make Kingston famous. The fleet at this event consists of members from 8 nations with ages ranging from 20 to the early 70s. Can you imagine jumping under a Contender boom at 70+ years of age. Gil Woolley is an amazing athlete. We are sailing out on the Foxtrot course and several competitors can’t resist taking shortcuts through the rocks by Snake Island – some great damage of rudders and centreboards continue. More to come I am sure. The forecast for today was wind for the North. This makes for a crapshoot with the wind moving easily 30 degrees and varying pressure from around 5-12 knots throughout the course. We started right on time at 12:30 about half the fleet went left and the wind made its first of many shifts to the left. Some sailors including Christoph Homeier and Soren Andreasen who had both been on the right hand side tacked over and were above most of the fleet. Marcus Hamilton (current world champ) and a few others were just 5 seconds late in the shift and were quickly left behind. The right hand side of the course had less wind and was not able to make up the ground. Just a reminder to register for the Worlds before July 15 to get the cheaper rate (go to: http://cork.org/reg_contender.html). Also, I've just posted a great little write up about the course we'll be racing on, courtesy of John Curtis, an Olympic sailor who is very familiar with the area. See here: http://contenderworlds2008.blogspot.com/2008/07/foxtrot-course-local-knowledge.html. Videos about sailing a contender can be found at video.google.com or at youtube.com. Several Contender helmsmen upload their videos to the google or youtube Servers to make them available for public viewing. You can do the same if you'd like to share your movies with the contender world. Most of the videos are homebrewed stuff. There are a few professionally taken films. The most famous one is about the World Championship, held at Lake Garda 2004. Its about 60 min long and worth every minute. If you don´t know much about this beautiful Contender dinghy this will convert you! You can choose a direct link to a movie. Just click the thumbnail below to open the first movie. You can scroll through to the others. Each video plays in a new window. The 2008 International Contender European Championships took place at Punta Alta , Tuscany in Italy from the 31st May through to the 7th June. The regatta was held at the PuntAla Camping Resort who catered for the 92 competitors from all over the world including Australia , Austria , Canada , Denmark , Germany , Holland , Italy , Spain , Switzerland and the UK . With measurement over, the practise race was held on the Monday to acclimatize the sailors and the race team to the championship ahead. Because of the size of the fleet, the competitors were split into 4 groups who all sailed against each other in the initial qualifying rounds of the regatta. Congratulations to the new European Contender Champion Giovanni Bonzio. More Infos will follow soon. A light and fluky day. The first race was abandoned after 4.5 legs when the wind shifted and died. After a spell ashore the race was restarted later in the afternoon. Gernt Guertz was first around the windward mark with the seaward side of the beat paying off well. The race was shortened at the leeward mark at the end of the second round. Overall results to follow but Marcus is now in First followed closely by Andrea. The race started in a solid trapezing force 3 which dwindled during the race. The left side of the course was favoured and it was from here that the leaders emerged. Christoph Homeier led from the first mark and was never caught. Richard Batten arrived here second only to find that his start was a few yards too early. Matt Aston followed up his win of the previous day to consolidate with a second. With the fleet too timid to try the right of the beat the race became a boat speed procession the left with a minimum of place changing until the nip, tuck and shouting of the finish area. See full Detailed Result List from Italy Day 2. This was the first race of day2, at the start the wind was light just above 5 knots, we had 2 general recall before a clear start with the black flag, the start line like all start in day2 was in favour of boats starting at pin end, also the left side of the course was in favour and at top mark those guys were leading, I wasn't in a great position of around 15th place, Giovanni Bonzio was second and soon first during the first reach. The Jury started to flag few boats for breaking the pumping rule, in the top of the fleet only Dirk Lafleur was "done". See full Results from Day 1 in Italy. Here are Race reports for three of the races (still waiting for the fourth Roberto) and current results. Race 1 for Red and Green fleet got underway in 15 knots of breeze with a cleat start 1st time. Andrea Bonezzi stamped his authority on the race early and led from beginning to end pulling out a commanding lead by the finish. Behind him Homeier, Holden, Langdown, Jones and Aston had a tight battle for the remaining positions. Eventually Homeier’s superior downwind speed told the story as he took 2nd. Holden finished 3rd and Aston got a lucky shift up the last beat to sneak 4th from Landown. North Sails is looking forward to 2008, another year of ongoing involvement in the Contender Class. The North CM-3 model is going strong, and for 2008 we will be moving onto a new cloth style. Following two seasons of hard use in the proving grounds of classes like the Finn and 505’s, from 2008 we will be using a laminate cloth with Technora fibres to carry the loads. The fibres are black in appearance, rather than the golden yellow of the Kevlar fibres used previously. They have plenty in common though, with good longevity and a high modulus to retain the designed racing shape as long as possible. Our experience suggests the cloth is slightly more supple to the touch, the films stay visually clearer for longer and the fibres are fractionally less prone to UV degradation than the Kevlar fibres. With this change in fabric we have taken the opportunity to update the panel layout of the sail. The cut now has vertical radial panels in the tack area, specifically to manage the cunningham loads even more effectively. The clew patch layout is also modified, and a panel along the foot (which sees relatively low loads) is cut partially from sailcloth with less fibre passes, for increased visibility on the race course. The World Championships are being held in Canada this year, and North Sails’ Ethan Bixby will be in attendance. In his new boat he’s looking forward to a great regatta. Wishing you all the best for your racing in 2008. We are in the process of finalising the details for sending a UK container to the worlds in Canada this summer. This promises to be a great event and from what I can make out, Canada is a fantastic place to visit as well. The Canadians sure get 10/10 for effort so far and I know they will make all visitors very welcome. If you are keen to go (or just interested and want a bit more info) please make yourself known to either Tony White ( anton_blanc@hotmail.com ) or myself (nick.grace@virgin.net) ASAP. Hope to see loads of you at the Dinghy Show this weekend. Warning - attempts at humour are embedded in the site. In northern Europe with its hundreds of Contenders, Wintertime is not far away. Most of you, we think, do warm their feet indoor at the stove and got a hot drink. Some fearless Champions will held there Traning also in temperatures below zero, but most Contenders are stored away for next season. But what about your Sails. These precious Artworks from Skillfull craftmanship. How do you treat them before storing? Contenderclass.org was interessted in and got hold of an Expert. Joel McDonald from North Sails UK gave us a closer view to this topic. If you follow him, he says, your sails will last longer, and give you an advantage to the guys who leave them in the dingiyard while snow falls. We will be sailing out of Kingston Canada for the Worlds in 2008. We will be on the Foxtrot course to allow for the biggest seas and most wind! Winds are normally from the SouthWest and around the 15 knot range with the thermal, wave height 1m. Here is a Youtube link to the area we will be sailing near, we will be further out the lake to the right. "I started boat building in 1998, working for Bob Hoare Ltd, building Contenders and Poole AB’s whilst undertaking a City and guilds in Yacht and Boat building which I completed in 2003. I then left Bob Hoare Ltd and joined Latham’s Boatyard repairing wooden yachts and involved in running the office until April 2006 when I set up my own business building and repairing dinghies and small yachts. " announced via mailgroup, heres the preview of the new poster. Medemblick you can get your personal copie from Soeren directly. and visit your local copy shop. a significant other, wife, fellow sailor or intelligent child as a helper. Most of the pieces that you are putting down are roughly rectangular. putting down the first corner. never separate it again after it has stuck to itself. up to the shrouds and the compete inside bottom). I started to do one side with Henkel Tomsit R710. single handed, without any assisiting person. like Pattex, comes out of the house (Henkel) like Pattex). but the work went much faster than with the Tomsig glue. make the work look better, but the sheets were solid on the boat. nothing seems co come off so far. Terokal 2444 (Pattex???) is the faster solution. to reduce weight but don't go into the glass underneath. Just enough to barely know where it is. # 60 grit. to buy one. You will wind up using it for lots of projects. I formerly bought packs with 5 disks but now I buy 25 at a time. the solvent in the glue bubbling the progrip up off the deck of your boat. boat rebuilder, in my area, to have it wielded by a paticular person. see what you would do. line) to_hopefully_stop the crack growing. appearance of a new crack somewhere in the proximity . will have the same effect, is cheaper and easier applied. usage as a flag pole. This remains me of my good old Boeing 707 repair days. This is a typical case of stress corrosion cracking. replacing the material that is not effective any more. How many frames should I add? is a fillet of glass-filled epoxy good enough? Is epoxy the right glue or should I use something else? width as some ?6mm plywood), with a skillsaw/ jig saw. good to me for an older boat!) her up. under the progrip to help. if you can track him down. they are built. I just did not do it soon enough. job of thinking and about 1 day doing. and rear inspection ports to the beam. I have not figured out how to pump in the glue yet. through the cockpit floor lined up with the glue groove. added weight is in a good location. Videos about sailing a contender can be found at video.google.com or at youtube.com. Several Contender Helmsmen upload their videos to the google or youtube Servers to make them Public. You can do the same if you like to share your movies to the contender world. Most of the videos are homebrewed stuff. There are a few professional taken films. The most famous one is about the World Championchip, held at Lake Garda 2004. Its about 60 min long and worth every Minute. If you don´t no what it is with this beautiful Contender you will get a real clue. You can choose a direct link to a movie. Just klick the thumbnail below. They open a new window. This article has some information taken from an old Contender Newsletter, written by Mike Beggs after the Worlds in Imperia in Sept. 1973. Most people have now arrived, we are still missing a few Germans a Dane, 2 Dutchies and some Brits. Measurements was going very smooth today, I recon that half the fleet has gone through the measurements already. More after the practice race. (and with some pictures of the harbour and the boats, maybe also from the race cource).